One reason for my incomplete understanding of power engineering is that the stuff is complicated. Another is the upshot of this post: I dug far enough to conclude that more research is needed. That phrase is a deadened cliche, but I mean it. We need to learn more! Considering the potential stakes, the effects of magnetic storms on grids are too poorly studied. Seven-figure expenditures on research might stave off 12-figure damages (as in trillions). For an employee of a philanthropy, that’s a bottom line. And the practical conclusion being reached, and my time being tight, it seemed efficient to stop there. I’ll explain that conclusion just below. But first I stress that my view on the potential value of funding in this area is attributable only to me. The Open Philanthropy Project will weigh this cause against other possible focus areas. Power lines and transformers are easier to fathom than the objects of the previous posts—sun spots the size of the earth and coronal clouds hurtling through space at 1% of the speed of light—but their behavior during storms is not necessarily better understood. One challenge for science is that to test a high-voltage transformer under realistic conditions, you need to channel enough power through it to serve a small city, and that is hard if you don’t have a spare small city on hand. Another challenge is that transformers are diverse in design, materials, age, quality of manufacture, and operating conditions, all of which impedes generalization. And transformers are, rather literally, black boxes: it’s hard to monitor what’s happening inside of them. Still another obstacle is that utilities and transformer manufactures probably know more than they say about the nature and consequences of the geomagnetic currents flowing through their systems. In what follows, I’ll try to give a sense of what is known. 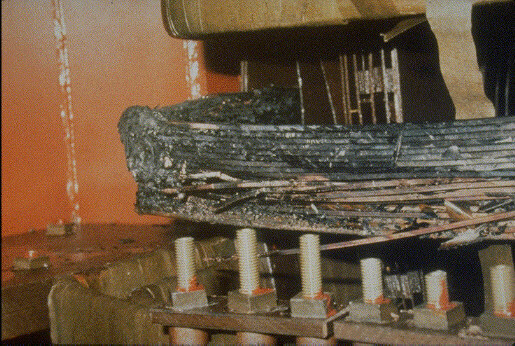 The research literature contains scattered reports of failures of high-voltage transformers, in New Zealand, South Africa, Sweden, the UK, and the US, and among other countries. It turns out that many of these cases violate an image central to the doomsday scenario: currents of once-a-century proportions spiralling into transformers and frying them within minutes. The 1989 storm, for example, disabled two transformers in Québec and several at the Salem nuclear plant in New Jersey. Yet the currents that undid the Québec transformers were not generated by the storm but rather by hydroelectric dams to which the transformers were linked. As the Québec grid went through a disorderly, 72-second collapse, these transformers were momentarily forced to receive energetic load from the dams while being cut off from the grid to which they normally conveyed the energy. The recorded cause of death was “overvoltage.” As no other transformers appear to have been disabled, these two were casualties of the grid’s largely successful self-protective response. But the Salem plant’s experience is nonrepresentative in that the plant’s location put it at unusually high risk. Situated on an artificial island in the Delaware Bay, the plant complex served as an attractive electrical bridge between the regional power network to the west and the conductive Atlantic Ocean to the east. And the igneous ground beneath the plant is electrically resistive, so it could not absorb any of the intense electrical pressure. So, on the one hand, the Salem plant transformers look to have been more vulnerable than most. On the other hand, their story illustrates the danger of ignoring geomagnetic storms when designing power systems. The gas concentrations began to creep upward after the Halloween storm. Perhaps during the storm, paper insulation around some of the wires was damaged, leading to short circuits and, in time, additional overheating. This suggests the existence of a perverse “goldilocks” magnitude for geomagnetically induced currents: weak enough not to trigger protective shutdowns, strong enough to disable a high-voltage transformer—in time. The South Africa experience makes me wonder: perhaps the common focus on extremes (including in my own work) is partly misguided. Perhaps the greatest risk lies with once-a-decade rather than once-a-century storms, or with lower-latitude exposure to those most extreme storms. I have not managed to obtain the data for the lower graph, but the two graphs together make me reasonably confident that space weather is a major proximate cause of high-voltage transformer failure in the United States. Some engineers have experimentally run large currents through high-voltage transformers and measured the impacts. Typically these currents have been constant (direct current or DC, like what comes out of a battery or solar panel) rather than oscillating (like the alternating current or AC that is produced by most power plants and sent through most transformers). DC is an imperfect proxy for geomagnetically induced currents, which tend to vary more slowly than standard AC, but are hardly constant. 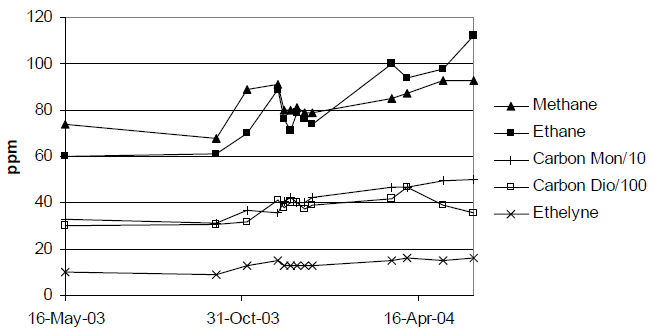 And in Québec, four researchers comparably tested two production transformers and found comparable reassurance. This is all, well, reassuring. The major caveat is that we cannot be certain what would have happened under more realistic conditions: if the test current had been volatile as in a real storm, if the transformers had also been carrying normal power loads, and had been, say, 30 years old instead of new. Engineers have also built computer models to simulate what happens inside a big transformer when a geomagnetic storm sends electric current into it. Leading proponents of this approach are Ramsis Girgis and Kiran Vedante of ABB, a company that through mergers and acquisitions has retroactively become the maker of most high-voltage transformers in the US. Girgis and Vedante contend that geomagnetically induced currents would do no disabling harm to the “great majority” of transformers. Why? Storms affect transformers in two main ways. The first is distortion in the currents going in and out. Normal currents are composed of smooth AC waves oscillating at 50 or 60 times per second with fixed amplitude measured in volts. In a storm, the waveforms might gain noise, or wobble in frequency. The energy involved might not be overwhelming, but any such distortions can disrupt a finely tuned power system. Second, at particularly energetic moments, the storms can generate large current spikes that saturate the transformer’s magnetic core and cause overheating. The second effect, argue the ABB engineers, takes places over minutes, perhaps even hours, while the first is nearly instantaneous—and should trip protective equipment that will disconnect the transformer before the second does serious harm. If a large storm “trips” many transformers, a blackout may ensue. But in that fragility lies resilience: after the storm passes, the grid can be switched back on. Girgis and Vedante may be right that transformer destruction will be the exception during major geomagnetic storms. I hope so. In their defense, they’ve been right so far. Forgive the sarcasm. My purpose is not to impugn anyone’s professionalism but to highlight the dangers of relying on manufacturers’ assurances when the stakes for human life are high. Confronting a risk this great with the seriousness it deserves calls for a more disinterested assessment. These four lines of evidence combine to produce a strange state of knowledge. Theory and field tests reassure. Statistical correlations and evidence from specific cases such as in South Africa suggest that not all is well. I draw three conclusions—or infer three hypotheses for further exploration. First, modest magnetic tempests may do more harm over months than massive blasts do over minutes. (Of course, the modest tempests and massive blasts can be the same storms, experienced at different latitudes.) 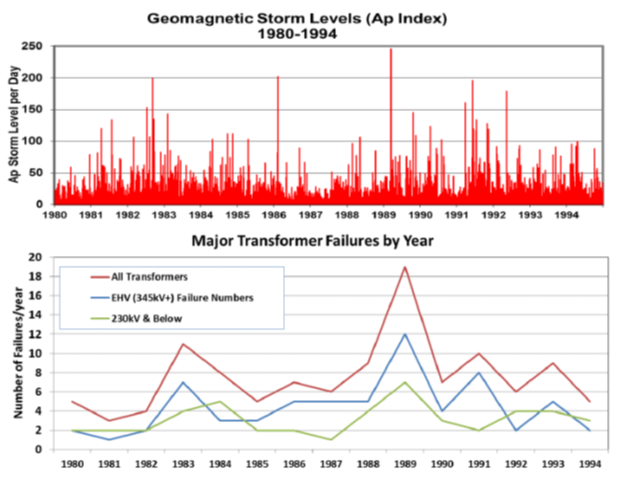 This hypothesis reconciles the year-to-year correlations between geomagnetic disturbances and transformer failures with the apparent loss of only a handful of transformers during the 1989 storm, the biggest of the postwar era. This idea has complex implications for the effects of magnetic superstorms. A really big storm might cause hundreds of transformers to fail—perhaps over the following year, perhaps predominately at middle latitudes. The resulting exhaustion of spares and manufacturing capacity could be a slow-motion train wreck. Or perhaps, as may have already happened without anyone noticing, the degradation will be so gradual as to create no humanitarian risk. Second, another way to reconcile the evidence at hand may be to factor in aging. The transformers simulated in models are ideals. The brand-new transformers put to field tests approximate the ideals as well as can be done in the real world. Perhaps as transformers wear out they become more vulnerable to storms. If a major storm administers the coup de grâce to many at once, one might argue that the storm is not the primary cause of their demise. But that would give little solace to people freezing in the dark. Or, in a subtle variation on this idea, perhaps old transformers are vulnerable by virtue of design rather than aging, as Girgis and Vedante suggested for some cases. Then the question becomes whether the field tests are representative of the current fleet of transformers in operation. My last conclusion is practical. The empirical questions relating to transformers and grids are easier to answer than most in the social sciences or, for that matter, in astrophysics, because experiments can be run. And with so little research done, we are probably shy of the point of diminishing returns. With money, much more could be learned about the vulnerability of transformers and grids. The same goes for mathematical modeling: with modest expenditure, models could be built in the public domain that would be subject to broad scientific scrutiny and empirical testing. Such investment in empirical and theoretical research would be worthwhile, for it might lead us to confirm and curtail a major vulnerability of modern civilization. Girgis and Vedante succinctly lists these cases while arguing against geomagnetic storms as the cause. A more developed but gated version of their article is here. Moodley and Gaunt 2012 refines the story of one of them, suggesting to a link to 2001 activity as well.